Licorice seems to be one of those “love it” or “hate it” flavors – probably because it has such a strong and distinct taste. 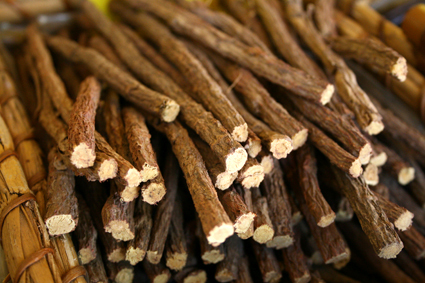 Licorice is not just a candy, it is actually an extract from the Glycyrrhiza Glabra plant, which means sweet root. Despite their strikingly similar flavors, licorice is not related to anise or fennel, and is actually a legume, related to beans and peas. While licorice has a stronger flavor, anise and fennel are commonly used to artificially flavor licorice products. Licorice is a very popular flavor in Europe, found in many candies, soft drinks and liquors. It is also used in its natural state as a breath freshener – so move over tic tacs! The licorice candy, as it is best known to most Americans, is made up of licorice extract, sugar, a binder, and additional ingredients to add to its appearance. The candy concoction is poured into molds to get its familiar shape – whether it be licorice ropes, dots, gumdrops, coins, and other fanciful shapes. You may be thinking “what about red licorice?” Well, it just so happens that red licorice contains no real licorice at all since it has no licorice root in it. It is called licorice simply because it is soft candy molded to look the same as its black “cousin”, but has plenty of artificial colorings and flavorings. Nowadays, there are many different flavors of licorice candy ranging from apple to watermelon. While all of these “licorices” have the same texture of black licorice, none of them are licorice in the true sense of the word. I prefer to enjoy the real McCoy in the form of tea. When enjoying real licorice, be mindful, licorice is not pure sweetness. It can have negative side effects especially when it comes to high blood pressure, and should be avoided for those who take blood pressure medication. As I always say, everything in moderation and always check with your doctor before including any herbal remedy in your diet. Like licorice candy? Read more on my salty sweets blog post! Learn about absinthe, a licorice-tasting liquor, courtesy from nutritionist Leslie Dantchik.